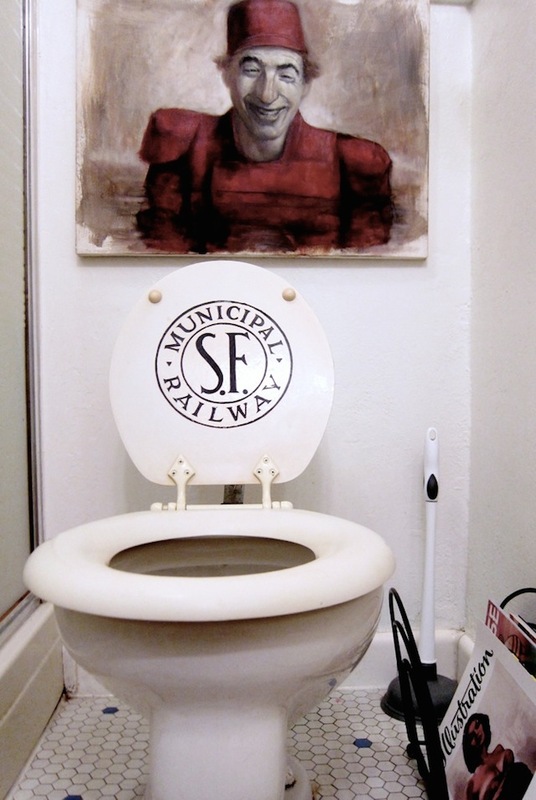 Remember the Muni toilet seat cover we saw on eBay? Well, lookee there. It turns out a Muni Diaries favorite, Josh Ellingson, ended up with the thing. Muni Diaries: How did you find out about the toilet seat cover? Josh Ellingson: A friend of mine saw a post about it and passed it along via email. She knew I’d want it and she was right. MD: What prompted you to buy it? JE: I’ve lived in San Francisco for fifteen years but only recently have been getting into the history of the place, particularly the SF Railway. Last year I started riding the F Line a lot and became interested in all the different historic streetcars. I collect odd things too, so when this came along, I couldn’t pass it up. MD: Did you have plans for it? JE: The toilet in my apartment is from the same time period and has the same hardware so I’m thinking of swapping out my old seat for this one. I don’t know though. I kind of want to frame it. MD: Did you auction or buy-now? JE: Yeah, I “Buy It Now”ed it. I’m not rich or anything but auctions freak me out. I saved on shipping though. The seller brought it to my place. He seemed like a nice guy. MD: What do you know about him? JE: He says he got it from a neighbor in 1983 when he lived on Franklin Street near Francisco. She retired from the SF Muni around 1970. 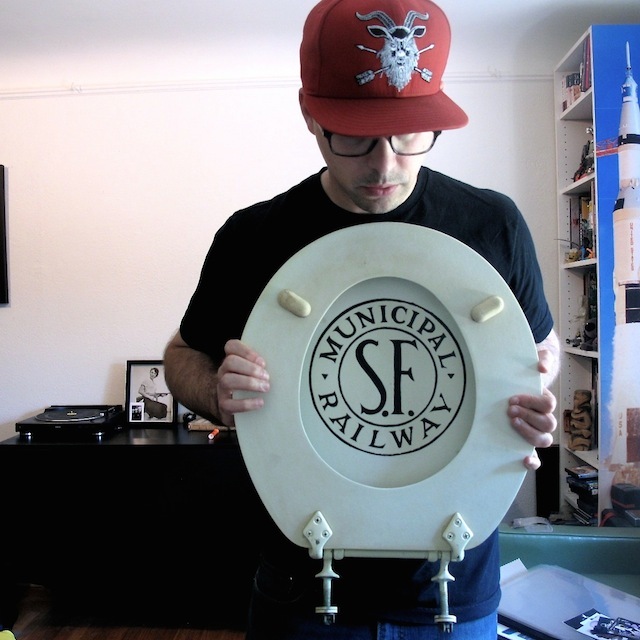 So was Muni just handing out toilet seat covers willy nilly in the ’70s then? I so love when a story comes full circle. Find Josh’s rad art over at his website, Ellingson.cc. And follow him on Twitter @ellingson. You mean this seat is authentic, a real Muni Ry. item and not a modern imitation? That is something. Indeed. Now I want to know why Muni was giving these things away to its employees.